Jessica Lynch was back on the air the other day, doing a television interview that brought more muddle than clarity to the erroneous reporting about her battlefield heroics early in the Iraq War. Lynch said on CNN’s HLN show that she could have embraced the storyline that said she fought like a female Rambo–and no one would have been the wiser if she had. No one “would have known,” she asserted. The notion Lynch was a wartime hero, that she had fought like Rambo, was thrust into the public domain by the Washington Post in a botched, front-page story published April 3, 2003. 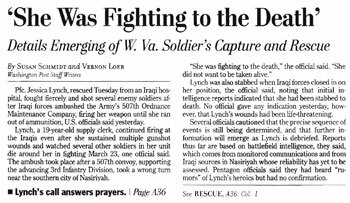 The Post described how Lynch supposedly was fighting to the death in the ambush of her unit in Nasiriyah, Iraq. The Post also said in its sensational yet thinly sourced report that Lynch had been shot and stabbed before being overwhelmed and taken prisoner. But as I discuss in my latest book, Getting It Wrong, none of that was true: Lynch had not fired a shot in the ambush; her weapon had jammed. She was neither shot nor stabbed. She did suffer shattering injuries in the crash of a Humvee as it tried to flee the ambush. But Lynch was no battlefield hero. She was taken prisoner and kept in an Iraqi hospital where she lingered near death until a U.S. special forces team rescued her on April 1, 2003. On HLN, Lynch said she agreed with interviewer Joy Behar’s suggestion that she could have claimed the hero’s mantle. “Absolutely,” Lynch said, “because nobody would have known. I mean, everyone in my vehicle was killed that day. So I was the only survivor out of the five of us. However, as I’ve noted previously, embracing the false hero-warrior storyline would have been untenable for Lynch. The colonel commanding the Army hospital at Landstuhl, Germany, where Lynch was treated after her rescue, told journalists the day after the Post published its hero-warrior story that Lynch had been neither shot nor stabbed. He thus undercut a crucial element of the hero-warrior tale–that Lynch had been shot and stabbed, but had kept fighting. That central component of the narrative was quickly exposed as untrue. Moreover, it became apparent in the weeks after the Post‘s story that there had been a real hero at Nasiriyah, that the battlefield derring-do initially attributed to Lynch probably were the deeds of Sergeant Donald Walters, a cook in Lynch’s unit. Walters either was left behind or stayed behind during the confusion of the ambush. He laid down covering fire as he fellow soldiers sought to escape. After running out of ammunition, Walters was captured by Iraqi irregulars, and executed. His body when exhumed bore stab and gunshot wounds. It’s curious–indeed, in my view inexcusable–that Lynch almost never refers to Walters. She didn’t mention his name in the interview with HLN. It’s curious, too, that interviews with Lynch never bring up the Washington Post and its singular role in propelling the Lynch case into the public domain. HLN’s Behar certainly didn’t mention the Post and its phony hero-warrior story.